Growing strawberry plants can be an income-producing alternative to traditional crop farming. There are an abundance of pick-your-own strawberry farms scattered across the USA. Unfortunately, however, numerous farmers each year decide to take the plunge into commercial strawberry growing each year…and go bust. 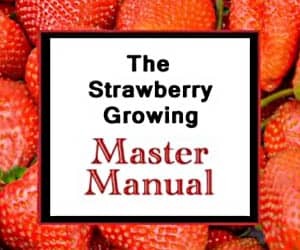 If you are interested in growing strawberries commercially, you should read entry 0006 in the Strawberry Plants Library before reading further. Then, with that information as background, continue reading this post to get an idea of the sequential steps involved in growing strawberry plants commercially. This sequence is followed by most commercial strawberry farmers. Of course, there is some variation between farms, but this overview will give a general idea of what is involved. Two other variants can be viewed here and here. Between 15,000 and 20,000 strawberry plants are planted per acre (17,500 average). For a large commercial strawberry farm, hundreds of thousands or even millions of strawberry plants will be planted each year. The commercial operation will sustain their strawberry plants throughout the winter by fertilizing and watering them appropriately. Row covers will be used to protect them from freezing temperatures at night and damaging winds. Around the middle or end ofMarch the plants will begin blooming (depending on climate). While strawberry plants are generally propagated by runners or division since the modern cultivars do not grow true from seed, the flowers still must be pollinated well in order to ensure plump and full strawberries. With a near-universal market for honey, many commercial strawberry growers have a small side business selling honey. The hives they maintain house the honey bees needed to ensure maximum crop yield, and the honey byproduct generates additional revenue for the entrepreneurial farmer. Strawberries grow and ripen rather quickly and must be picked daily on a large commercial strawberry farm. The number of workers required to pick varies, but a general estimate is that 65 to 70 workers are needed to keep each 1,000,000 strawberry plants picked. See this link for Strawberry Picking Jobs. The first strawberries will ripen at different times as climate and weather dictate, but late April through mid-June is a typical season. To maximize yield, many commercial strawberry farms test their plants throughout the growing season to ensure they are getting the nutrients they need to produce the best quality strawberries possible. Leaf samples are often collected weekly or bi-weekly and sent away for testing. Usually, states that have a significant number of strawberry farms will offer the testing at state university laboratories. Testing is important as too much or too little fertilizer will alter the taste and ripening of the berries. A pump station is also used by most commercial growers. The station provides the water and nutrients the strawberry plants need through the drip irrigation lines laid when the plastic mulch was laid. This also provides an extra measure of liability protection as the water is filtered and tested to make certain all USDA specifications are met. 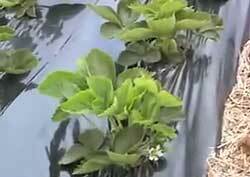 Growing strawberry plants commercially can be quite profitable. However, the time and equipment expenses involved in starting and maintaining a successful operation are not negligible. Understanding the costs involved and the cash flow of an operating strawberry farm is as crucial (if not more crucial) as understanding the strawberry plants themselves. But, we can all use more strawberries, so if you are ready to take the plunge into strawberry farming, go for it! I have industrial size chicken housea that i would like to convert to grow strawberries. In southern mississippi. Do you think that is applicable? What varieties of strawberry is used for commercial growing? Many different varieties are used depending on the specific climatic conditions of the area where the growing occurs. When is it the appropriate time to prepare and plant strawberries in Southern Africa? If you plant during your fall season in the southern hemisphere, usually in March, they will be able to establish themselves prior to the colder winter months. Doing so will allow them to produce a good harvest for you the following spring. Good luck! we are commercial farmers in Zambia. tobacco, wheat, soya maize and cattle. we want to go into strawberries grown in green houses (to obviate the heavy summer rains that we have here). our high temps Oct-nov reach 36 C though once the rains start, latest mid November it cools down. winter night temps 8-9 C though not every night. generally around 12C. very little and seldom do we have frost. green houses would be covered with top plastic (to stop rain) and overall shade cloth when needed. what i need to know is: what variety should we look at and where will we be able to get our plants from? i saw that new cultivars dont grow from seed so can we fly in runners for example or would it have to be smallest plugs available? i would much appreciate your input. To get the latest cultivars, you will likely need to get plant material imported somehow. The biggest obstacle you are likely to face is importing them. Customs policies for most countries (I’m not familiar with Zambia’s policies) prohibit the importation of living plants due to the risk of spreading exogenous diseases among the native flora. I’d recommend checking with your customs agency to see if it can be done, and what is involved, if so. Good luck! I want to prepare a 1 acre field for plastic culture in southern Oregon. Is there a local business you know of that has the tractor implements used to lay the plastic and drip lines? We need to lease/rent or buy so we can properly prepare the fields? I am not aware of any local businesses that have the equipment/implements available for rent. I’d recommend contacting the local agricultural extension agent for assistance. They are a goldmine of resources and could likely help you get everything rolling. Good luck! Strawberry plants are temperate by nature and simply don’t thrive in extremely hot and humid or tropical environments. With that said, Chandler strawberries are more heat-tolerant than many other varieties. Good luck! Actually, strawberries can grow in nigeria, very well infact. We have semi-temperate regions like jos and the mambila highlands. Farmers have been growing them commercially in jos. I am also looking into growing in mambila. Thanks for your report! Good luck! It all depends on your local rules and regulations regarding such things. I’d recommend calling your local County Commission office or City Hall to inquire about whether or not a permit is required. Good luck! Mr strawberry man what’s a good company wear I could purchase black plastic for the strawberries beds? I want to buy wholesale. I’m not sure the best place to buy wholesale. I’d recommend stopping by your local farmer’s co-op or calling your area’s extension agent. They will likely be able to direct you to the best sources. Good luck! Unfortunately, strawberries don’t do well in either Nigeria or Ghana. They can be grown, but it is difficult to do it successfully enough to profit from their cultivation. Sorry! Unfortunately, not very well. Strawberry plants prefer temperate climates. Sorry!